Looking for a little cheer for the holiday season during your trip to Paris? Each year, elegant Christmas lights displays and festive decorations adorn over 130 streets and monuments in Paris, turning the city into a true winter wonderland. The capital's old-fashioned department stores also get all gussied up for the season, unveiling elaborate and creative decorations and holiday window displays that delight visitors of all ages. Read on to learn where to head for lights and decorative displays in 2018 and 2019, and embrace all the magic of Paris this winter. The majestic Avenue des Champs-Elysées is flooded with lights every winter, with light-drenched trees stretching all the way from the Place de l'Etoile and the Arc de Triomphe to the Place de la Concorde. This year, 200 trees lining the avenue will scintillate with lights, coupled with glimmering "shooting star" effects. Don't forget to visit the large Christmas market around the nearby Jardin des Tuileries while you're at it, grab some mulled wine, and find some original, authentic Parisian Christmas gifts. The lights were switched on at 6:00 pm on November 22nd, 2018, with fashion designer Karl Lagerfeld presiding over the festivities this year. The displays will be taken down on January 9th, 2019. The street is lit from 5:00 pm until 2:00 am each day, and all night long on December 31st, to bring in the new year in Paris. The elegant Place Vendome and surrounding area is also festively lit for the holiday season. Stop for a memorable holiday afternoon tea at the recently renovated Ritz Hotel to warm up, then go out and admire the gorgeously lit square and the beautiful, narrow little streets around it. See the lights from November 22nd, 2018 through January 10th, 2019. Known for its luxury boutiques and high-fashion shopping opportunities, the prestigious Avenue Montaigne and its elegant houses are getting all gussied up for the holidays this year. The classic Paris department stores district near the Opera Garnier is awash with lights and elaborate window decor and imaginative scenes every holiday season, starting in early to mid November and throughout the January sales season in Paris. Find them at Galeries Lafayette, Printemps, and surrounding stores on Boulevard Haussmann, 9th arrondissement. 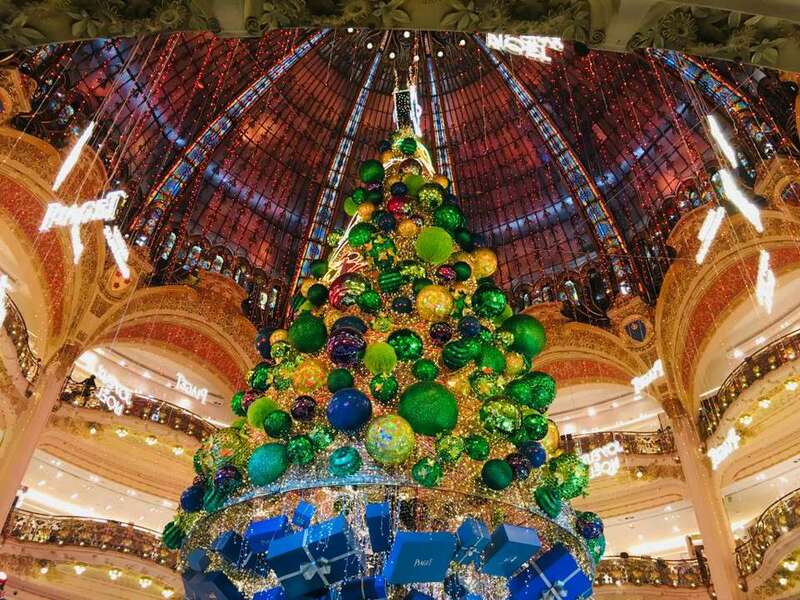 Galeries Lafayette unveiled a giant tree bedecked with shiny green, blue and red baubles and sponsored by the French jeweler Piaget on November 8th under its art-deco cupola inside. That same day, the Galeries unveiled its annual holiday windows displays, which are themed this year around Santa and his workshop at the North Pole. Inspired, fantasy-filled figures and brighty colored packages light up the windows. The whimsical windows should prove a treat for kids especially. Just down the block, Printemps department store flips the switch on its lights and holiday window displays from mid-November. In 2018, the Bon Marché department store on Paris' left bank (Metro: Sevres-Babylone) and the BHV department store in the city center (Metro: Hotel de Ville) are also unveiling festive window displays, all worth beelining to. The outdoor shopping "village" near Paris's National Library in the south of the city will be festively lit and decorated for the holidays from mid-November 2018, and displays will remain up for visitors to enjoy until January 20th, 2019. This is an interesting and off-the-beaten-path part of town that's worth visiting when you're searching for something new, and the expansive mall is perfect for last-minute Christmas shopping. See them from November 15th, 2018 through January 20th, 2019. As if Notre Dame Cathedral weren't stunning enough on its own, each Christmas season the Gothic cathedral hosts an enormous, lavishly decorated tree on its main plaza. The decorations generally appear in mid-November to early December. From mid-November to early December, the Paris City Hall will brilliantly light some 125 streets around Paris for the holidays, with lights switched on from 5:00 p.m each night until 2:00 a.m. Some streets illuminated last year included la rue Vieille du Temple in the Marais, Place des Abbesses in Montmartre, Avenue de Saint Ouen, Boulevard Saint-Germain, Rue de Rennes, Place de la Convention, Rue de Belleville, Place du Jourdain, Rue de Richelieu, Rue des Saints-Pères, or Rue de Grenelle. Check back here soon for a complete list, and in the meantime, visit this page (in French, but you can find out the street names by each Paris district (arrondissement) very easily, then locate them on your own map or smartphone). Best April Events in Paris: What's On in 2018?